We woke up to a beautiful clear day. 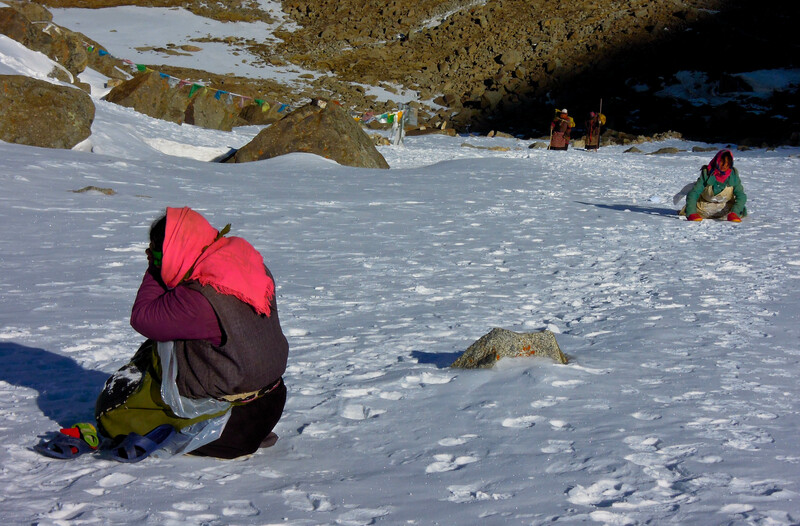 The day we arrived in Darchen it was snowing and the pass got a few centimeters. 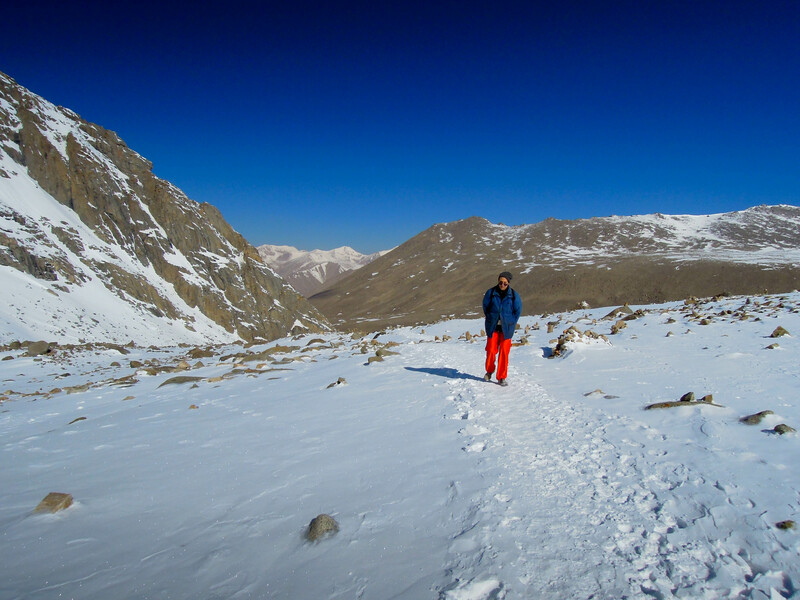 The forecast was calling for more snow, but we lucked out and had clear skies all three days of the kora. We got an early start this morning. 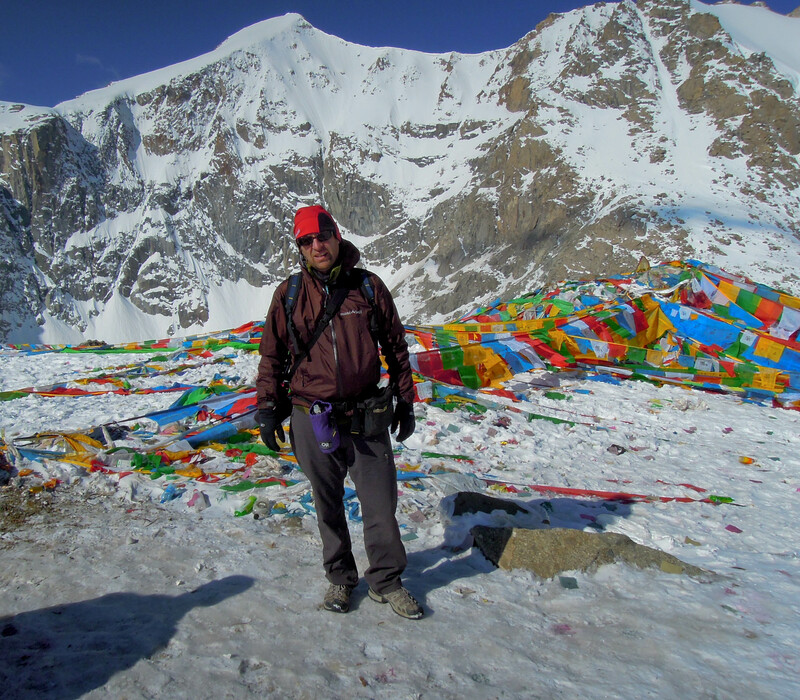 Our Tibetan guide, Tenzin, said it would take 3.5-4 hours to reach Drolma La Pass. From where we camped it was about 6.4 km and 762 m higher. That doesn’t seem like much of a climb, but when you are starting at 16,500′ and climbing to 18,550′ it is pretty significant. Stephen, Brad, and I left together. Bruce, Susan, and Tenzin followed behind. Susan was struggling a bit with the altitude. We felt pretty good as long as we didn’t try to go too fast. 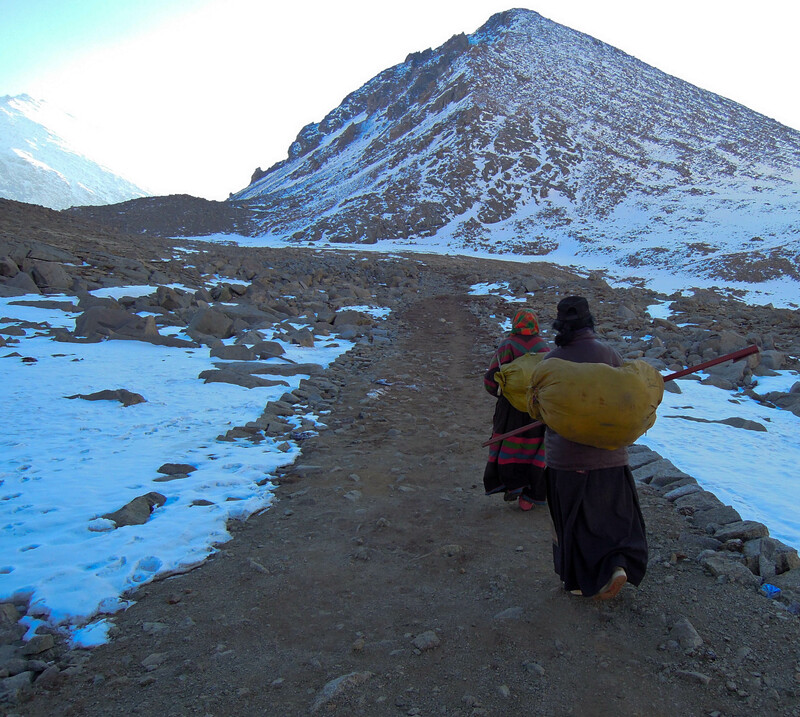 We began to see more and more Tibetan pilgrims heading up. Many of them do the kora in one day, which brings more merit than in the traditional three days. Bu the ultimate is to do full prostrations all the way around. This usually takes 14-16 days, but can be done in as few as 8 days as our guide had done previously. Tenzin had also done it in a day. This time with us was his 68th kora. He did not think he would make it to 108 as his knee had been bothering him the last few times. Tenzin was a very devout Buddhist. 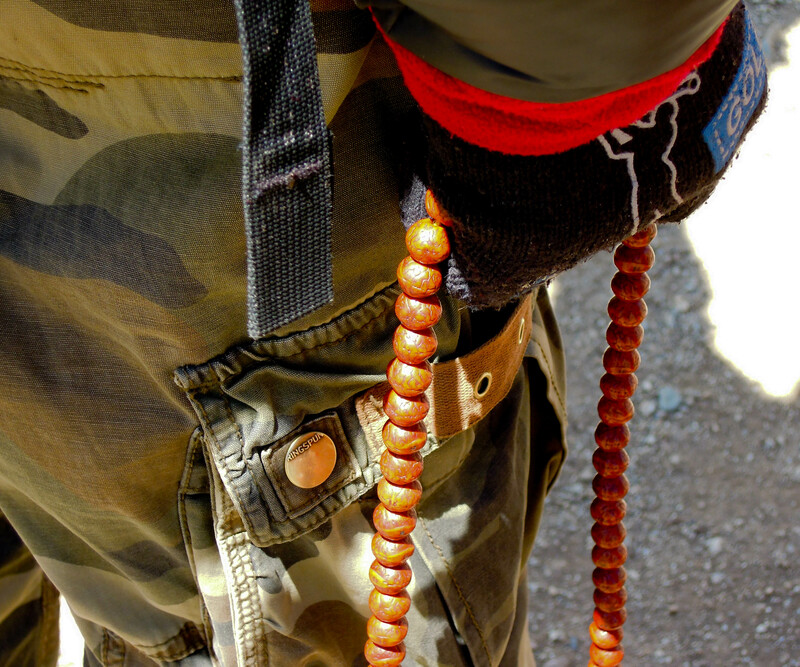 He always had his prayer beads in his hand, always, in the car, at camp, hiking. He never left them and they were well worn. Right out of camp we climbed a long series of switchbacks. At the top of this section the trail flattened out a bit, then descended before it turned into snow as it headed up toward the pass. 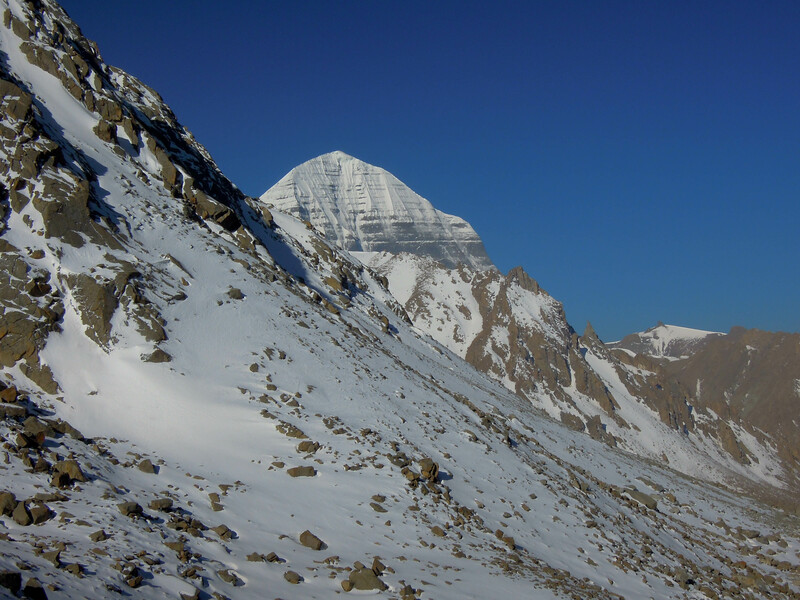 Heading up this snow slope, we had our last look at Kailash, then it was obscured by other mountains. 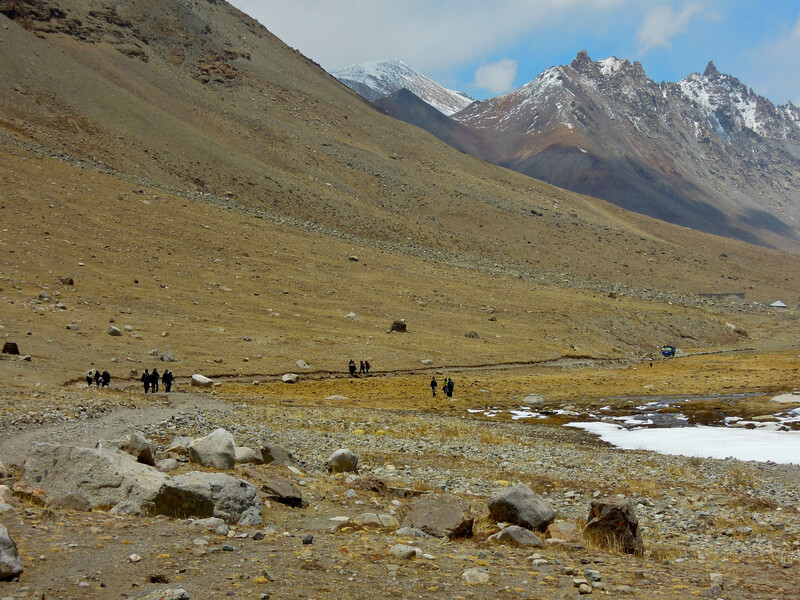 We pass several pilgrims heading up to the pass. Some of them were doing prostrations. I was blown away by the devotion of these simple, sincere people. 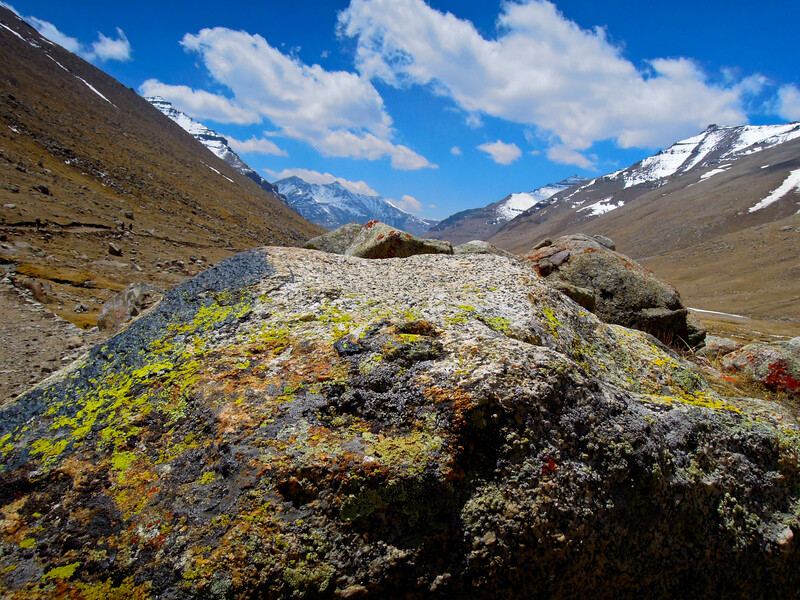 Prostrators taking a break on the way to the pass. I was particularly impressed with this girl. 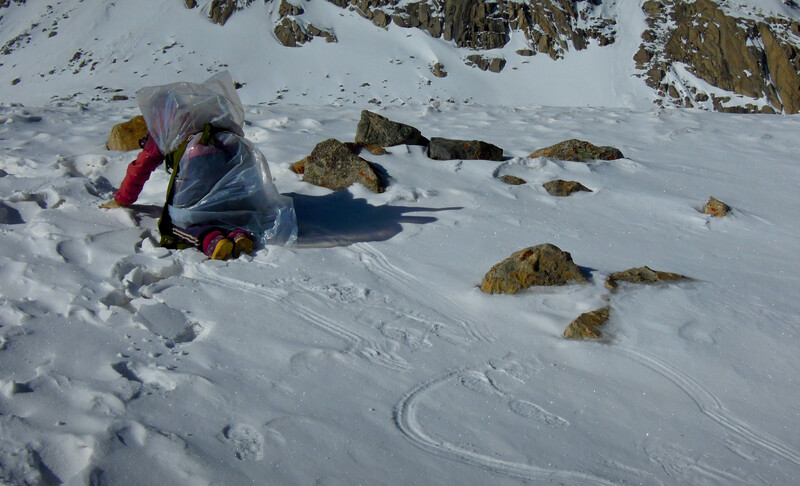 She looked to be about 13 or 14 years old and was cruising up through the snow doing full prostrations. You can see the marks in the snow from her hands. They will mark on the ground the extent of their reach, then stand up, walk to that point and prostrate again. I have a short video clip of her on my Flickr photostream. Stephen and I would take about 30 steps, then stop for a moment to catch our breath. As we got higher that became 20 steps, then rest, then 15 steps and rest. We were certainly feeling the altitude. 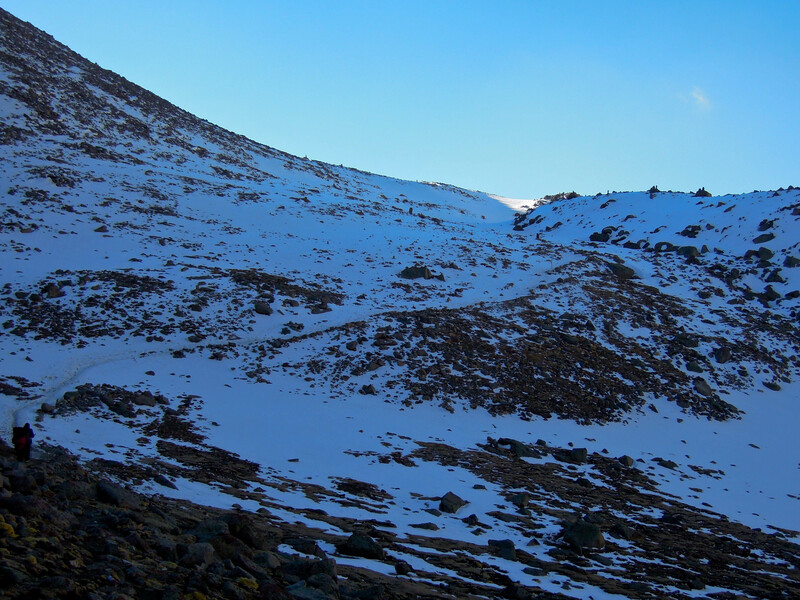 The highest I had been before was a mixed ice and rock climbing ascent of Mt. Meeker in Rocky Mountain National Park in Colorado. 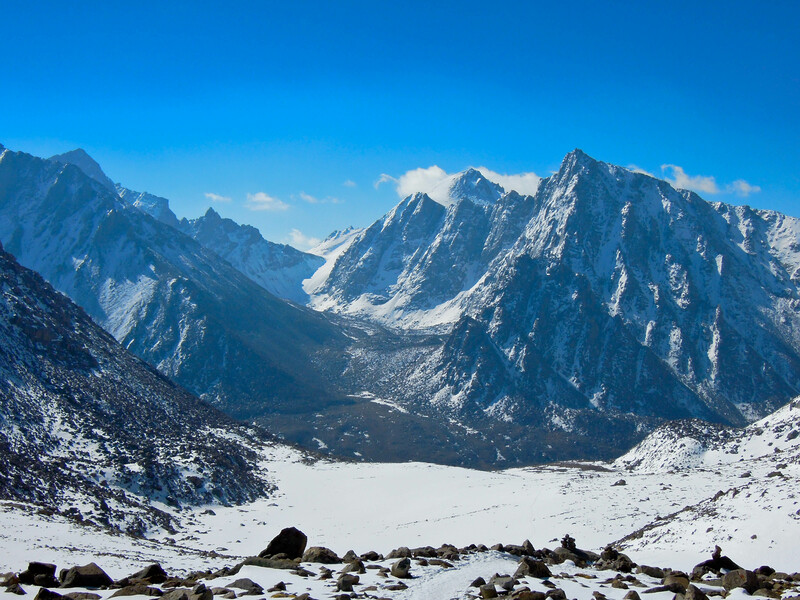 That peak is 13, 911′. 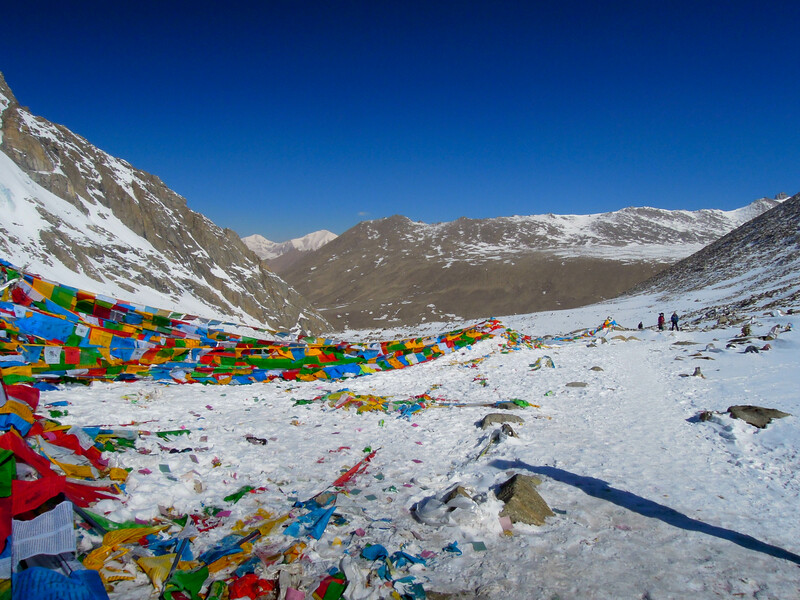 We finally arrived at the pass covered with prayer flags and the traditional Tibetan white scarves. Brad had arrived a few minutes before us. There was one other Western guy there as well as a few Tibetan pilgrims. It took us 2.5 hours from our camp. We felt pretty good about that. 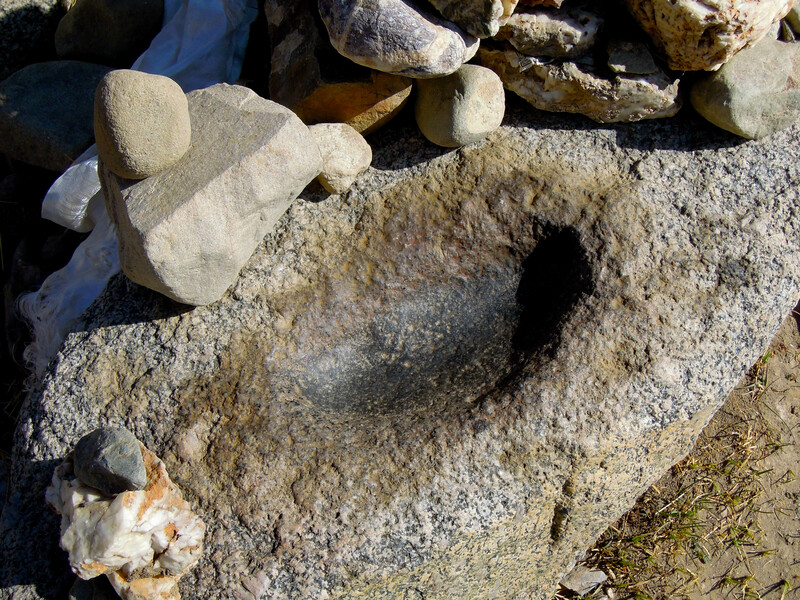 We had first seen this pilgrim at Drirupuk Monastery. 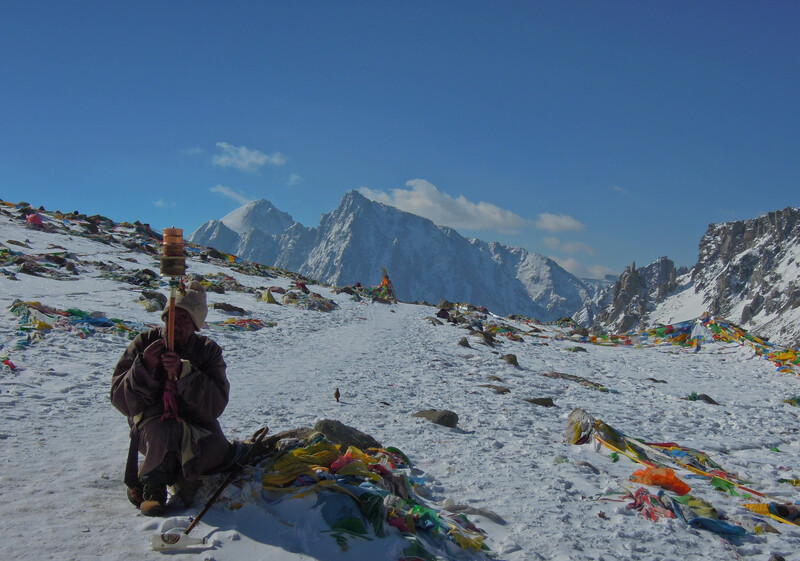 He had a huge prayer wheel that he was constantly spinning. 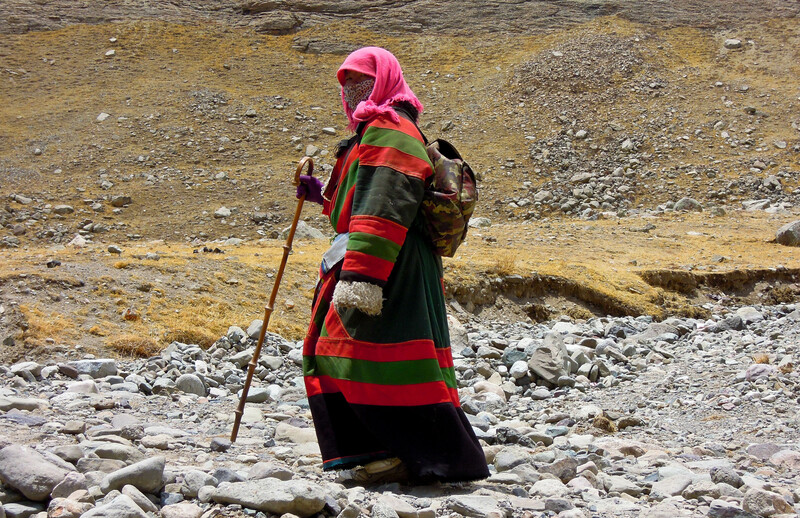 He looked to be in his 60’s but was probably younger than that as Tibetans typically look older than they really are. The views on the other side of the pass were spectacular. The mountains really were amazing. The photos do not do them justice. The trail heading down from the pass was steep and very icy. It was pretty treacherous in places. 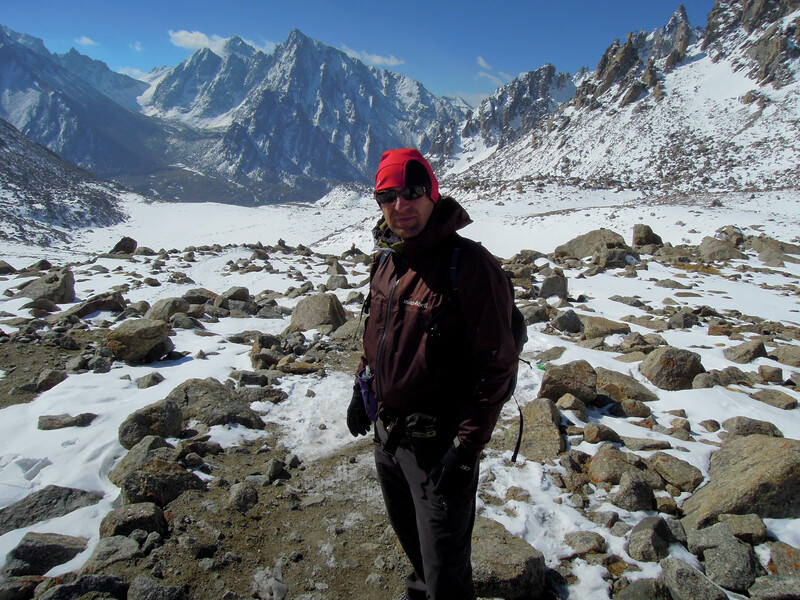 I love the downhills and like to hike fast, so I left Stephen and Brad and headed down. 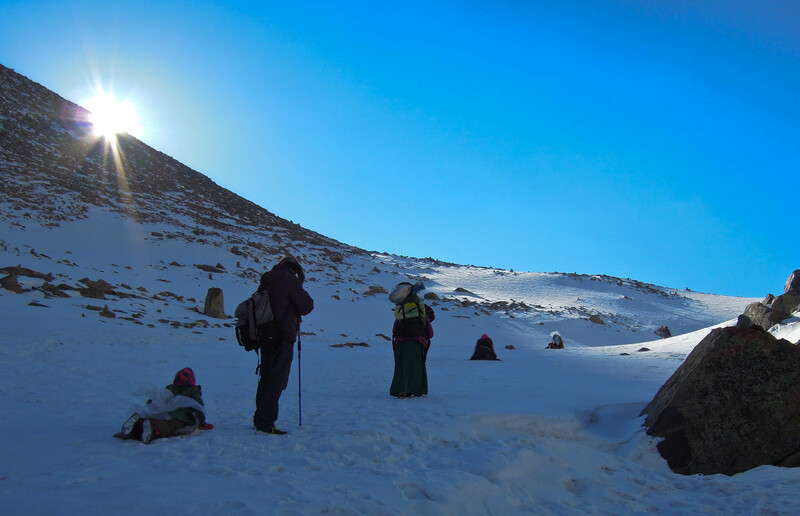 Pretty soon we were out of the snow and on very steep rocky terrain descending into another valley heading south. Where the steep section met the valley floor I decided to stop and take a break and eat a snack. 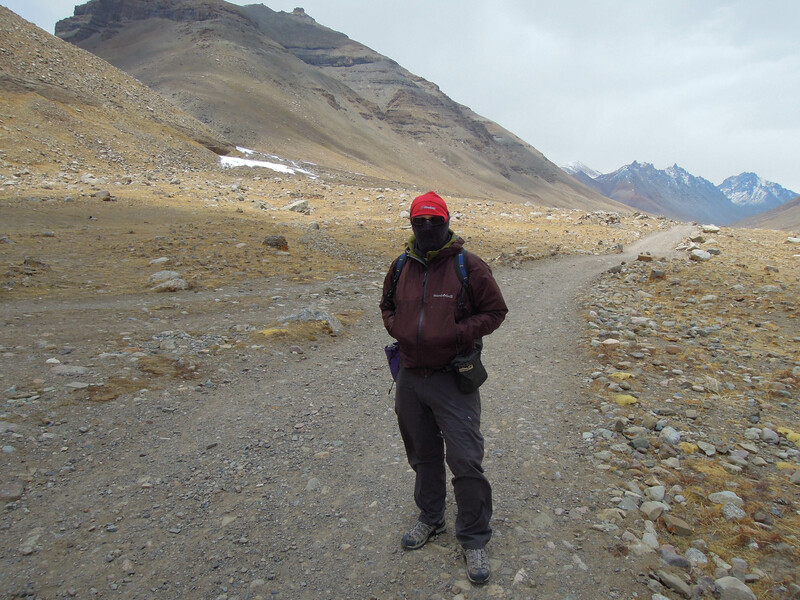 One thing that I did not anticipate on this trip is that with high altitude comes less oxygen to your extremities. We spent about 7 nights about 15,000′ and I had cold feet every night. I even wrapped my feet in my puffy jacket inside my sleeping bad and I still had cold feet. This was really strange because I seldom have cold feet, even ice climbing and winter camping. 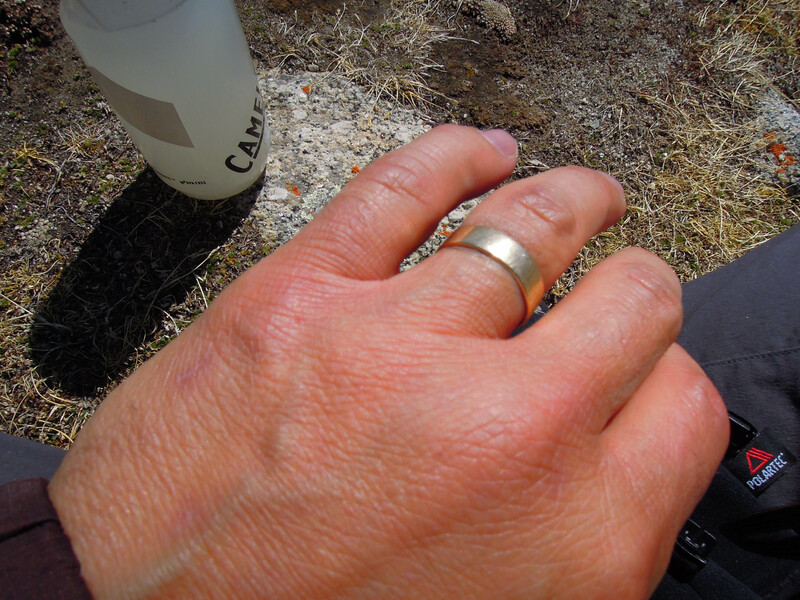 My hands were fine except for the day we hiked over the pass. I was wearing a pair of midweight windstopper fleece gloves and my hands got very cold. It was quite windy up there which contributed to it. When I stopped to take a break, I was down out of the wind and it was much warmer. When I took off my gloves I was surprised to see that my pinky fingers were a bit purple and swollen. After about an hour they were fine again. Stephen, Brad, and the rest of our group including our guide showed up shortly and we walked a short distance to a tent guest house. We decided to wait here for the Serpas and yaks. 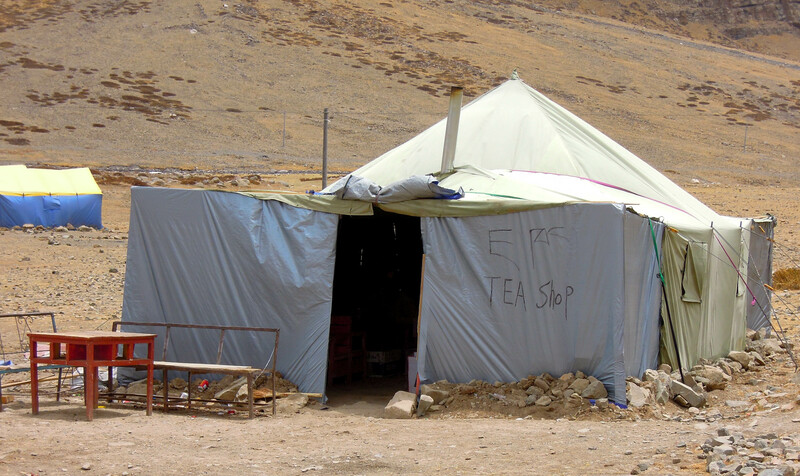 Tenzin wanted to make sure they knew where we would be camping. We relaxed inside for about an hour until they finally showed up. We then took off down the valley. We were under the impression that it would be a short distance to our destination, which was the monastery at Dzutrulpuk, the sight of Milarepa’s cave. Milarepa was an 11th century poet and Buddhist yogi. The trail followed a gentle valley along a peaceful river, grassy fields, and clear streams. 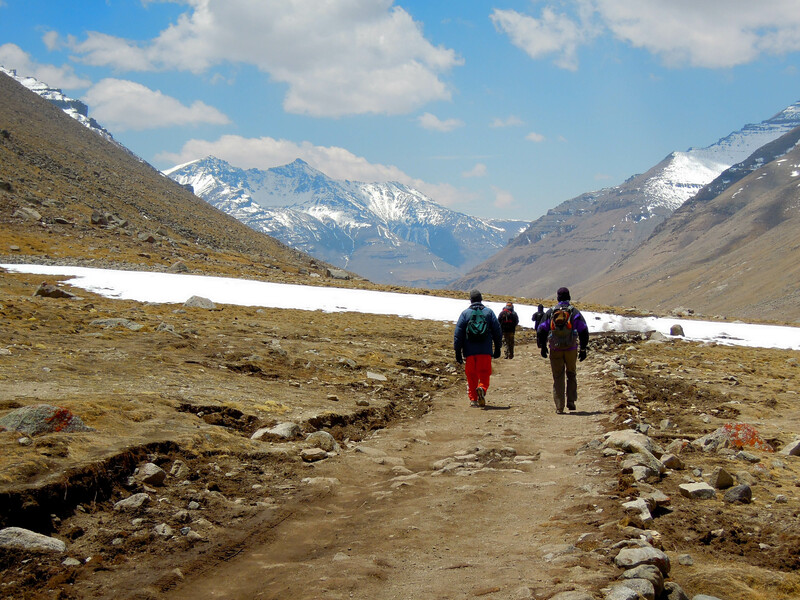 Our short hiked turned into hours as we trudged down the valley. 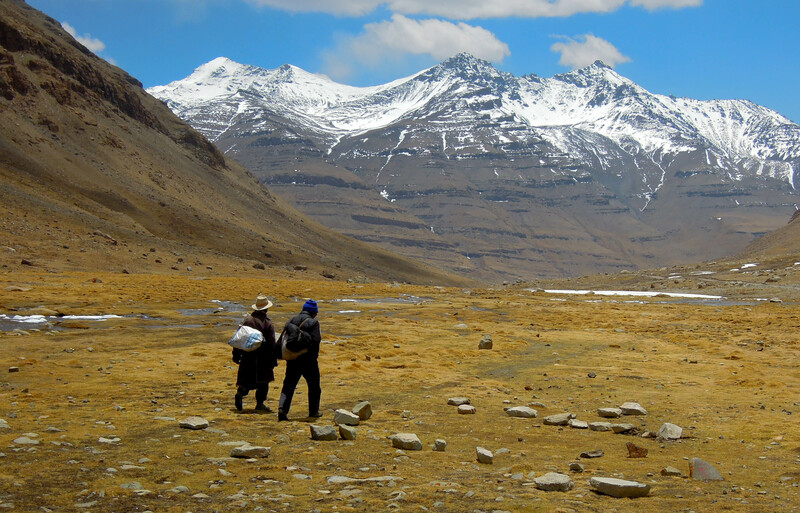 We continued to encounter pilgrims also hiking down this valley toward Darchen. In the afternoon the winds picked up and soon they were roaring down the valley. We came to expect this. It seems that every afternoon the winds would pick up. 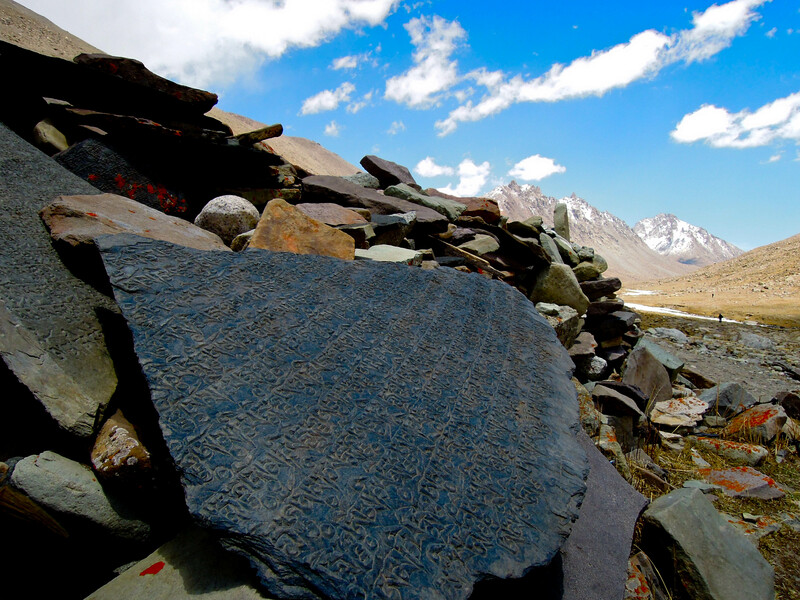 We experienced this all over the Tibetan Plateau. With the wind it got pretty cold. 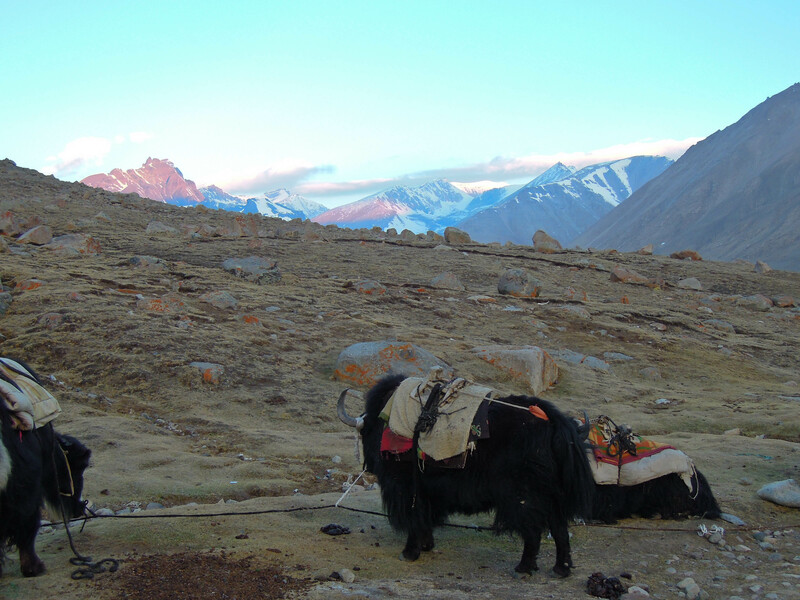 We decided to wait for the yaks as we were not exactly sure where we would be camping for the night. As we sat waiting it got pretty cold. I put on all my warm weather clothing, which consisted of a long sleeved base layer, fleece hoodie, Patagonia Nano puff jacket (a lightweight puffy jacket), and a hardshell jacket. 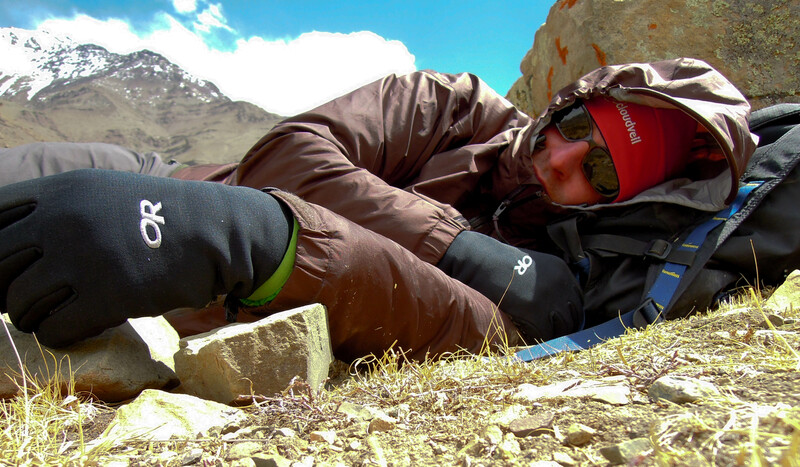 I found an large rock, curled up behind it to stay out of most of the wind and took a nap. We ended up waiting about two hours for the yaks. We got camp set up, ate dinner, and went to bed. Total distance for the day was jsut under 23 km. The following day was a short 2-3 hour (about 10 km) hike to the mouth of the valley where we were met by the Landcruisers and drivers. 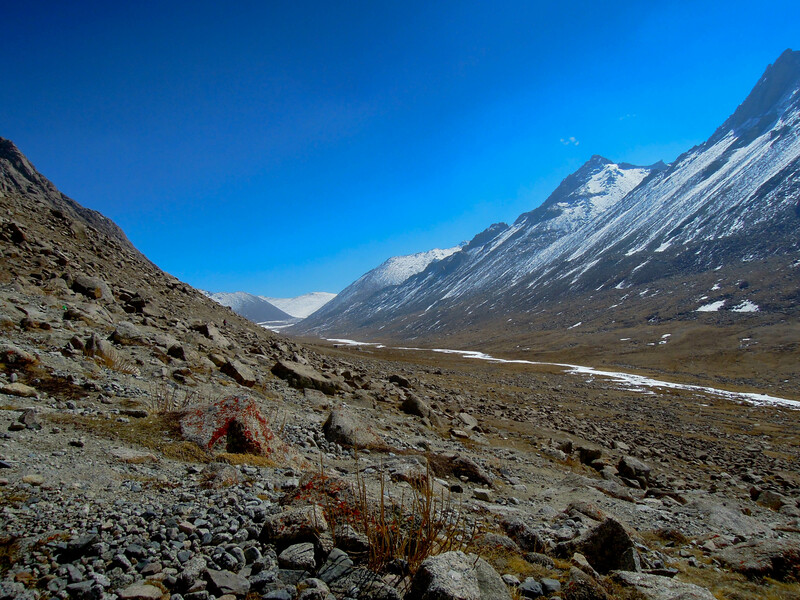 We returned briefly to Darchen, then began the long drive back across the Tibetan Plateau. 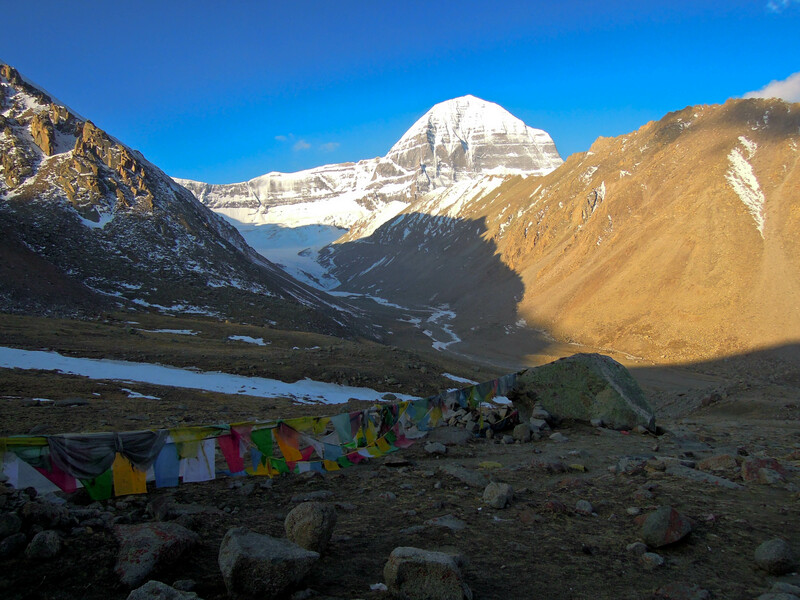 It was a very memorable trek. 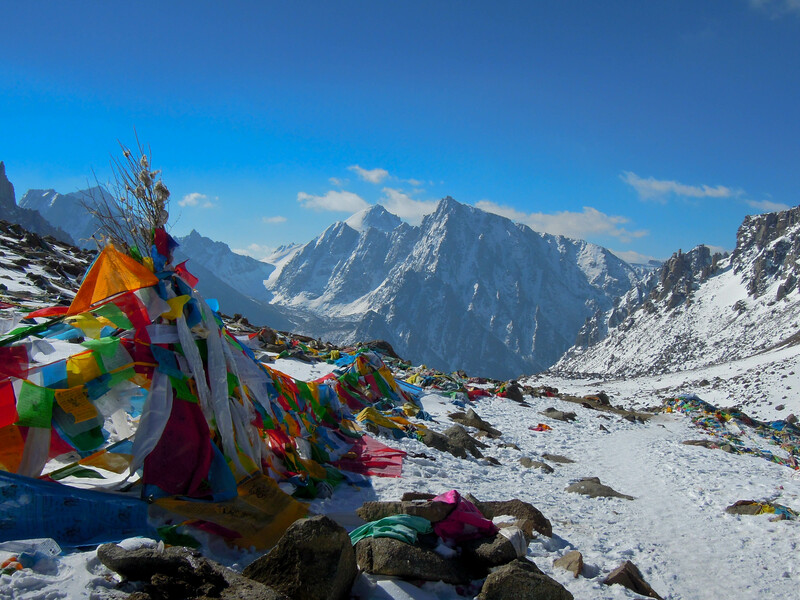 I was most impressed by the devout pilgrims making the circumambulation and the spectacular scenery. It really was breathtaking (literally and figuratively). I have newfound respect for high altitude mountaineers. It is really tough breathing up there and we were only hiking on a trail. I have spent most of my life climbing and I can’t imagine difficult technical climbing at high altitudes. Pretty amazing. 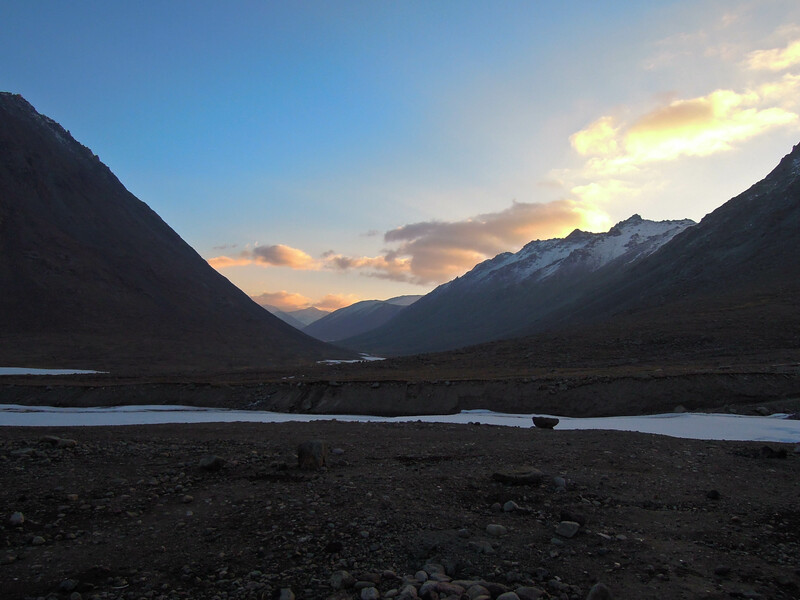 The wild landscape and the people of Tibet left a deep impression on me and I hope to return someday.